Onslaught block constructed was played extensively way back in 2003 and culminated in the Summer of that year at Grand Prix Detroit following the release of the block's third and final set: Scourge. The format pitted tribal themes against control elements and with the addition of Scourge, Goblins had taken over the meta-game. 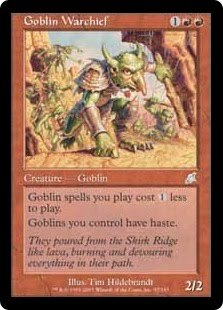 The entire format was hedged by the goblin deck and it dominated tournaments with some events seeing Goblins in 50% of the field. Thus, for the players, you had a choice: Play Goblins, or use the tools in the format that could beat them. The trick was doing so and not killing your game against the other goblin hate decks as well. This deck is explosive and has the potential for a turn 4 kill with hasted goblins delivering enormous sums of damage. A turn 4 hasted Siege Gang Commander can spell doom for decks that don't keep the goblin swarm in check. Quickly. Goblins packed shock for reach damage and helpful removal, especially in the mirror match. It leveraged Goblin Goon and Sulfuric Vortex out of the board to punish control decks and then Threaten for the mirror match. Clickslither was an important meta-game choice because it had the important trample ability and could survive against the game stopping Silver Knight. If Goblins was rock in a field of uneducated scissors, then the decks to beat them were the paper. There were a number of variants that could do it, but the best of those were the decks that could beat both Goblins and the other control decks in the field. Some of these control decks were mono-red. Some were mono-white. The best of them used both colors. For Grand Prix Detroit, Professional Bob Maher piloted a Red/White control deck to victory over a field of Goblins and control decks designed to defeat them. Maher boarded in additional shocks to stomp out goblins and then used a variety of tactics to give himself the advantage over additional control decks in the format. Wipe Clean was useful against pesky enchantments like enemy Lightning Rift's or Astral Slide. Maher's use of Silver Knight, massive finisher creatures and a wide array of control options anointed him of champion of Grand Prix Detroit. 0 Response to "Block Constructed Magic: Onslaught Block"